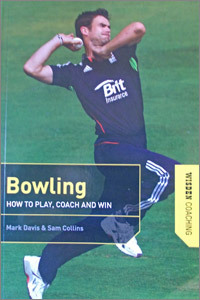 Wisden have brought out two coaching books recently, one on bowling and the other batting and very impressive they are too. This 131 page bowling book covers bowling terms, basic and advanced bowling, spin bowling, limited-overs bowling, the mental side and the need to practice. Mark Davis played for Somerset between 1980 and 1987 and is now head coach at Millfield School which has produced countless Somerset players. Sam Collins is a freelance journalist and former editor of wisdencricketer.com who formerly opened the bowling for Kent Under-19s and captained Eton College so we are in good hands with both authors. The first chapter starts with basic terminology before moving on, in the second chapter, to the basics of bowling which include how to grip the ball, the bowling action and how to stop bowling no balls. This is just a brief selection of the various points covered. The advanced section is aimed at medium and fast bowlers and includes a wide range of subjects of various types of bowling ( seam, various types of swing ), how to bowl off and leg-cutters, yorkers, bouncers and slower balls. Sledging is even given a mention but is rightly not encouraged. In short, all aspects are well covered in this forty-five page chapter. Spin bowling is equally well covered and all the latest developed deliveries such as the doosra are taught. Variations on certain deliveries are also covered before the book continues, in the fifth chapter, with bowling in limited overs. This covers the basics as well as bowling to aggressive batsmen and bowling at the end of the innings. The mental side of bowling covers pre-match preparation and post-match evaluation, fitness and what to do should the dreaded yips - the inability to release the ball - occur. In the last chapter, the need for practice in the season and off-season as well as advice for coaches is offered. The book is impressive not only for all the aspects covered and, as any reader would reasonably expect, diagrams are given on how to grip the ball for any given delivery but also for the interviews printed previously in wisdencricketer.com and pointers given by many of the top players. The book keeps abreast of all the latest developments and should be an invaluable source of information.